Last December I had the wonderful opportunity to visit one of the greatest cities on the planet, New Orleans. Nola is a world-class city and the people who live there are some of the most beautiful people I have had the honor of meeting. I just fell in love with New Orleans and I don't think anything will ever make me change my mind. Now, we all know that New Orleans is the birthplace of jazz and many other musical art forms. This is due to the many cultures that are represented there. You have the French and Spanish influence, the African influence (most important, I'd say), and the Caribbean influence, just to name a few. This is a colonial town but we also must remember that it was Louisiana before it was part of the United States. The French, who went back and forth in power in this area with the Spanish, did not want the territory to become part of the U.S. and to this day, it is not unusual for anyone born in the area to consider themselves Creole instead of American. 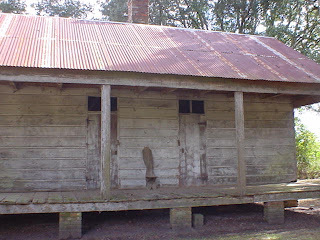 Above, you can see a typical colonial house; it has been transformed from the original Caribbean structure that was the norm in the area when the French colonists came. They were influenced by the architecture in Haiti/Dominican Republic and when they came up North, most of what was built was Caribbean in influence. According to one Old River Road guide, the architecture in the French Quarter is actually quite Spanish and one can see many of the former Spanish names of the streets along with the current French names. The plantation home above is called Evergreen and what is unique about this place is that the very wealthy lady who owns it has also preserved the 22 slave quarters that are also on the property. You can see one of them below. The cabin is meant to house two families and you can see the size of one of the sides of the cabin; not much space, at all. These cabins are entirely original - the cypress wood is very strong - and sharecroppers still lived in them in the 1940s. I was totally humbled when I stepped inside. Matilda Gray Stream is the woman who has made sure that this only collection of slave quarters of its kind has been preserved. In the main house, she also has a collection of dolls that a local African American artist fashioned after the actual slaves who worked on the plantation. She used the names and work information found in business documents. Many of the records are well-kept. We can see exactly who lived on the plantation, what work he/she did and what his/her monetary value was. Laborers were worth what they could do (a blacksmith was worth more than an elderly field hand, for example); house slaves were considered "private property," which meant that if the owner went bankrupt, they could not be taken as collateral. When one of the previous owners of Evergreen did die, his "private property" had stayed with him but had decreased in value because of aging. There is a reason I am bringing up New Orleans and the idea of slave quarters and private property today. First of all, what I've been given the chance to learn in New Orleans is that the real issue about the Katrina tragedy is not that the levees broke or that funding for repairs has not come through yet - that is a tragedy, of course, but the real tragedy is that African American folks were given subpar living conditions to begin with. There is no difference between the Lower 9th Ward or the 7th Ward and the slave quarters you see on this page. The residents who lived in the 7th and 9th Ward shacks lived dangerously close to factories and, of course, to the water. Just like the slaves living close to the master's mansion, the folks who lived in these wards lived close to where their work was. What has changed is that the mansion is now safely away from the hazardous living conditions of where the "slaves" live. That is, the people who profited from the work of the honorable people who lived in the Lower 9th Ward, for example, did not live in the risky area. I had the awesome opportunity to go on a tour of the Katrina damage. The activists and leaders at the Ashe' Cultural Arts Center gave me and others at the National Performance Network Conference the tour and showed us how the land in the Lower 9th Ward is not fit to build on because it is too low and there are laws that prohibit this. Nonetheless, the city has not raised the land to regulations and there are still folks living on it (even though most of the area is overgrown grass, despite Brad Pitt's efforts). New Orleans, in general, is having a difficult time finding and maintaining homes for low income residents. This trend in the greater United States has been well documented for the past decade and a half and the articles on it continue today. Add this to the healthcare crisis and our poor public education and what it all adds up to for people of color (Blacks, Latinos, Asians and all imaginable impoverished races and combinations of said races) is one thing: APARTHEID. Yes, I believe that this is what we are living under and what is happening in the U.S. today (what has been happening, yo!). My old Webster's College Dictionary defines apartheid as something uniquely South African, but Dictionary.com expands it to include all forms of segregation. And we are definitely segregated in terms of healthcare, education and housing, but more importantly we are segregated in terms of JUSTICE and INFORMATION. How else can we explain a New York judge finding it perfectly permissible to shoot an unarmed Black man 50 times? I read somewhere that Sean Bell was supposedly unruly; couldn't they just beat him up, then? If you're going to be unjust, can't you temper it with a little sanity and sanctity for life? This is one kind of justice for one kind of citizen and a totally different kind of justice for another kind of citizen. An unruly Black man gets murdered and an unruly White murderer gets acquitted. Note that the link to SeeingBlack.com above also announces the Bill Moyers interview with Rev. Dr. Jeremiah White which airs tonight on PBS at 9 p.m. (not sure what time zone that is, so check your local listings). Here is another perfect example of how Rev. Dr. White, Senator Obama, and now my former professor, Dr. Bill Ayers, have been used to discredit the work African American men have accomplished. Senator Hillary Clinton, no less, is the one to have tried to discredit Obama by associating him with Ayers. Who discredits the information provided by White and/or rich/powerful people who manipulate the media? No one. If someone tries to point how how the White House hires military men to conduct supposedly unbiased investigations of how the war in Iraq is being conducted or if abuses are occurring in Guantanamo, that person is a conspiracy theorist at best (a terrorist sympathizer, at worst). If the information comes from a person of color, it is discredited. If the information comes from the good ol' boys club, it is applauded, even if it is wrong. If the unruly person is a person of color, we can kill the guy. If the unruly person works for the good ol' boys, get some good lead out, sharp-shooter! If the housing or education is for the poor or the public, good luck finding something of value. If the housing is for the rich, sleep easy, you don't have to worry about floods or poisoning from the local factory a few yards away. If that doesn't sound like apartheid to you, I don't know what it will take to convince you. What is interesting to me is that while I was getting a really educational tour of New Orleans by Ashe' and by the wonderful tour guide at Evergreen (This lovely White Creole woman literally said, "Look, the slaves here were treated somewhat better than the slaves that were owned by the English, but they were slaves and in the end, that is despicable. I work here and I show these cabins and I have to live with seeing the cabins every day. I have to remember." I think it makes a big difference if someone can own up to that. 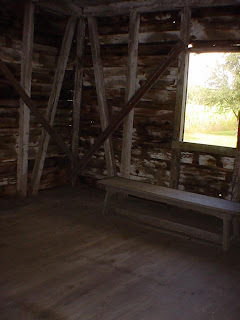 ), at Oak Valley, the other plantation tour I took, the tone was VERY different. 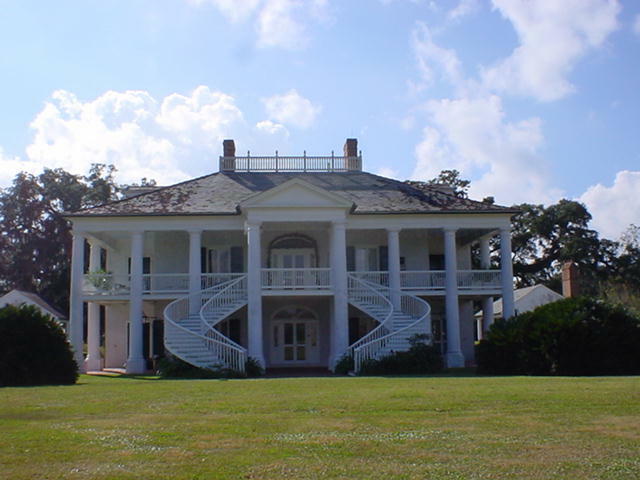 At Oak Valley, the tour guide wears a crinoline hoop skirt, offers tour-goers mint juleps and paints a lovely picture of plantation life, along with the imagined slaves fanning you on the porch, okay? How absolutely sick is that? Well, how is that any different from what is going on in the U.S. right now? Some of us want to face the past, honor what happened and move forward honestly, while others would like to build upon the lies and keep things just as they have always been - very segregated, an apartheid. You wouldn't believe all the middle-aged White people who loved the tour at Oak Valley, an estate that has been featured in "The Long Hot Summer" with Cybill Shepard and in "Interview with the Vampire," with Brad Pitt (he keeps popping up). One woman told me on the bus that she had always fantasized about sitting on the wrap-around porch, relaxing to the breeze, looking over the estate. I wanted to ask her, "And were the slaves part of that fantasy?" Our memory in the U.S. is quite convenient. If you're interested in seeing all the New Orleans pictures that I took, click on the link to gpwriters (on the right) and join the group. There is a link to the pics on the main page of the group. The pictures include shots of documents that list the value of the slaves on the plantations. Note that a skilled slave could be valued at over $1,000 and this is back in the 17 and 1800s, so imagine what the work of that person is worth today. Probably a lot more than the average person of color gets paid. I would say it is worth better housing, better education and definitely having one's life intact on the eve of one's marriage.